These easy Chocolate Kiss Cookies only need a few minutes on the stove and no baking required! 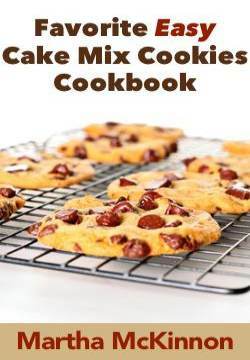 Start with mixture of cocoa, peanut butter and oatmeal, then top with frosting and finish off with a chocolate kiss and you've got a delicious and easy cookie recipe that your kids will love to help you make. 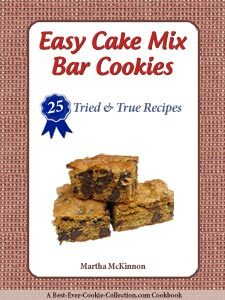 Plus they have just about every ingredient you could possibly want in a cookie. These special treats are perfect for your holiday dessert table, potlucks, swapping cookies with friends, bake sales or after school snacks. For best taste results, we recommend using regular peanut butter, not generic or low fat. In a medium saucepan, bring granulated sugar, cocoa, milk and butter to a boil, stirring continuously. Add peanut butter and vanilla and mix well. 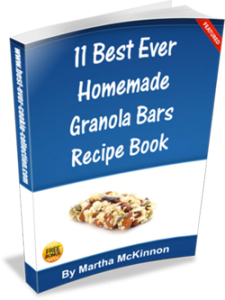 Place oats in a large bowl and pour warm mixture over oats, mixing well. Drop rounded teaspoonfuls of dough onto cookie sheets lined with waxed paper. In a medium bowl, beat confectioners sugar, cream of tartar and egg whites on high speed until stiff. 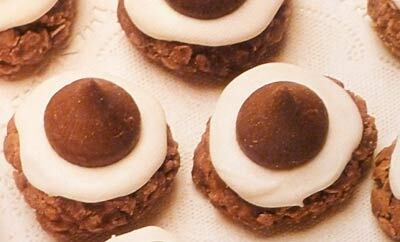 Flatten cookies slightly and decorate with frosting and top with a chocolate kiss. Chill cookies at least 1 hour before serving. Store in airtight container in refrigerator between layers of waxed paper. This recipe yields about 48 Peanut Butter Oatmeal Kisses.